Across Scotland in around fifty cemeteries lie the remains of members of the Polish Armed Forces. In 1940, after the fall of France, the remnants of the Polish Army were evacuated first to ports in England and then onwards to Scotland. The reformed Polish army, 1st Polish Corps, was given the task of defending the east coast of Scotland against the threat of invasion by Nazi Germany. In Perth, at the Jeanfield and Wellshill cemetery, there is the largest number of Polish war graves in Scotland. A special section in the cemetery has 381 Polish war graves. A cemetery in Edinburgh, located at Corstorphine Hill, also contains a significant number of graves with 175 members of the Polish Armed Forces being buried there. The book Polish War Graves in Scotland - A Testament to the Past is a record of the war graves of members of the Polish Armed Forces, including civilians, and those who served in the Polish Resettlement Corps from 1940 to 1949. The names of all the Polish casualties, together with their rank, unit, date of death, age and place of birth (where known) are listed for each of the cemeteries where members of the Polish Armed Forces are buried. 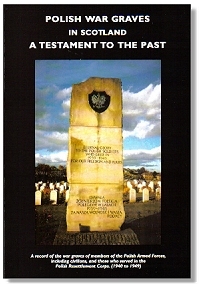 The author, Robert Ostrycharz, states that his aim was to locate and record all the known Polish war graves in Scotland. The Polish war graves are looked after by the Commonwealth War Graves Commission. They maintain the graves of over 2,100 members of the Polish Armed Forces in the United Kingdom located in 244 different places. The headstones for the Polish war graves all have a pointed tip and display the national emblem of Poland a crowned eagle. In addition to the names of the deceased, their date of death, their age and their unit, the words Polish Forces are engraved on the stones. Publisher - Published in 1999. Book Availability - Copies of the book can be obtained from the author Robert Ostrycharz. Details can be found on his Scotland and Poland website. The book also contains the following tables as appendices. There is a bibliography and 28 black and white photographs of Polish war graves at various cemeteries in Scotland. Information leaflet about Poland and the Commonwealth War Graves Commission. This page was added on 07 November 2009.